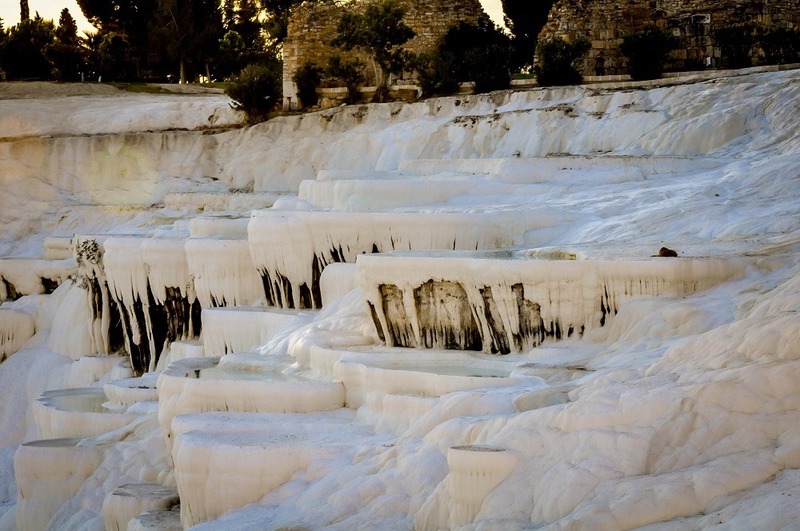 The white travertine terraces of Pamukkale, Turkey with their shallow pools cascade down the cliffs below the ancient Roman city of Hierapolis, located on the hills above the Menderes river valley. For nearly a thousand years, people have been coming to the region to soak in the unique “champagne waters” that are heated by geothermal activity and the area has received UNESCO World Heritage Site designation. Since we are big fans of geothermal pools around the world, we knew we had to visit the Pamukkale hot springs and the famous Cleopatra’s Pool. Within the Hierapolis-Pamukkale complex is The Cleopatra Pool (sometimes called the Pamukkale Antique Pool). This is not a travertine pool. According to legend, this artificially sculpted pool was a gift from Marc Anthony to Cleopatra. It is actually the most famous of the Marc Anthony gifts to Cleopatra, the Egyptian Queen. Once it was surmounted by a Roman Temple to Apollo with ornate roof held up with Doric columns. Imagine how Cleopatra must have experienced this when you imagine it in it’s glory day. Although, it’s worth noting, according to the historical record, we don’t actually know if Cleopatra visited her pool. In the 7th Century, an earthquake toppled the surrounding building and the massive marble Doric columns tumbled into the pool – where they rest on the bottom to this day and visitors can swim among them (hence the name “antique” in the Pamukkale Antique Pool). We stayed in a local hotel on the hills up above Hierapolis, Turkey and entered the complex from above (it’s easier than hiking up from the town below). The Hierapolis entrance fee was Lira 35, plus Lira 5 for parking. From the upper parking lot, there was a convenient mini-bus that takes you directly to the Pamukkale hot springs (cost of the mini-bus was Lira 1 per person, each way). The Antique Pool entrance fee is an additional Lira 33 per person, but was worth every penny! Lockers are another Lira 5. 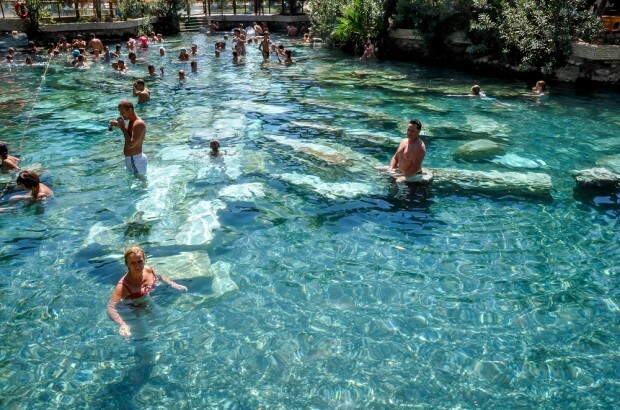 Of all the the things to do in Pamukkale, Cleopatra’s pool is on the top of the list! True to the advertisements, the Pamukkale hot springs featured sparkling “champagne water.” The thermal waters had little air bubbles released by the minerals that dance along our skin as we swam over the giant marble columns. Given how hot it was while we were in Turkey, we were worried the water would be too warm, but it wasn’t (about 36 C° or 97 F°). We arrived before 10:00am and stayed until 12:30, when the day-trippers started showing up by the bus load. 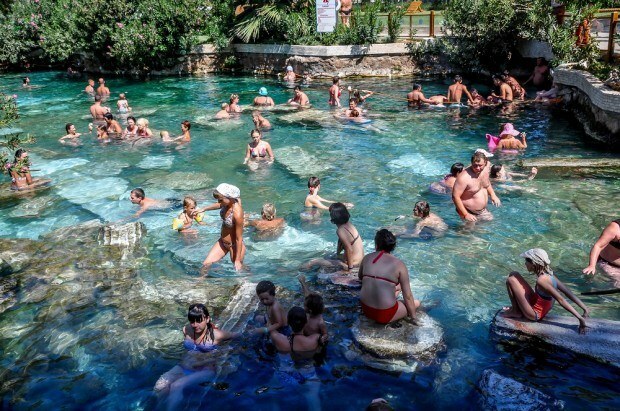 Technically, the entrance ticket is time stamped and is supposed to allow you two hours in the Hierapolis hot springs and the Pamukkale pools of Cleopatra. However, we found they did not enforce the rule. One thing we found to be fascinating were the Russian tourists taking posed beauty photos in the Antique Pool. 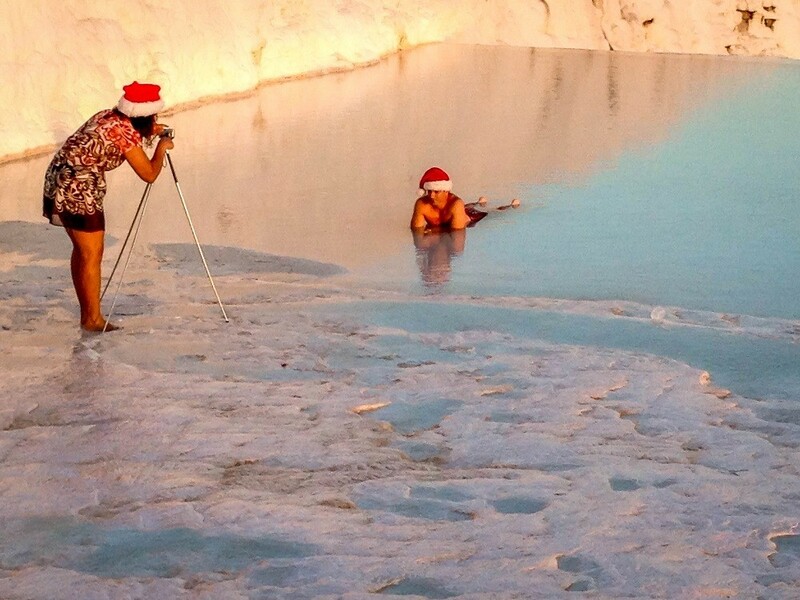 It is worth noting that the complete Turkish hot springs and pools of Pamukkale complex is full service. There are bathrooms and rental lockers to store your gear. But remember to take your ticket with you because the guy will collect it immediately before you enter the hot springs. There is also a restaurant on premise. We each had an awful hamburger lunch here and would encourage other visitors to avoid eating here (consider packing a picnic). Also you can get one of those fish pedicures. In the world of hot springs and geothermal pools, the Pamukkale Antique Pool may well be absolutely unique. We have never encountered another hot springs anywhere that has the minerality and champagne bubble effect within the waters. The Hierapolis springs and Pamukkale thermal pools are some of the greatest hot springs in the world! 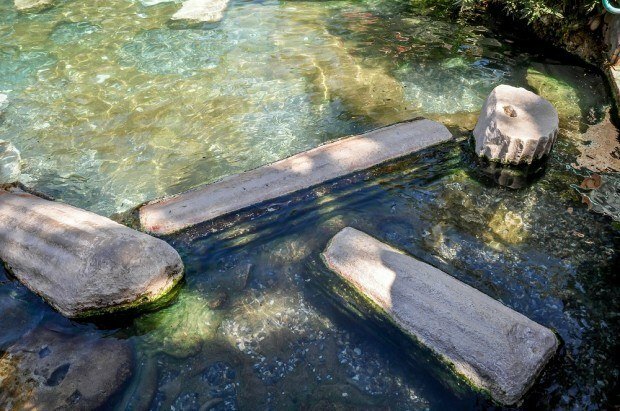 When is the best time to visit Cleopatra’s Pool? Most people visit as day-trippers from resorts, so the middle of the day is the busiest. Try to avoid visiting from 11:30am-4:30pm. We visited in the morning and it was fine. If we would do it over again, we’d visit in the evenings. There is a giant bat colony nearby and they fly around sunset, so if you’re visiting the pool later in the day, you might get to see it. Are there private Pamukkale hot springs? 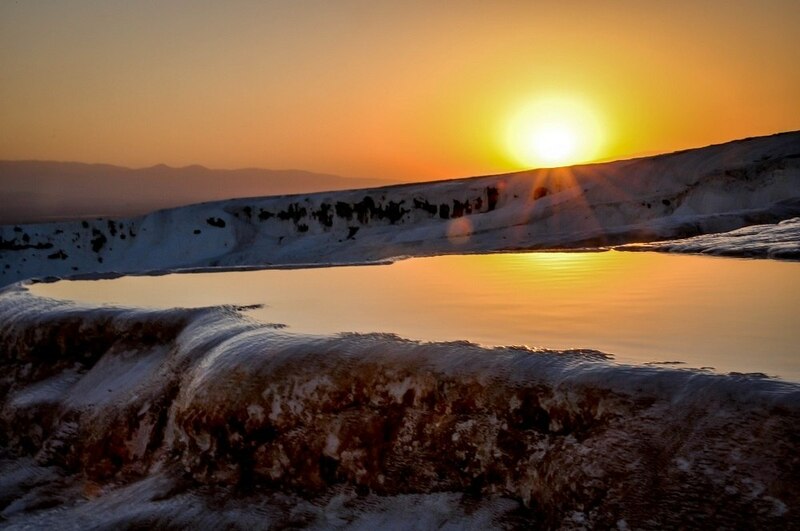 The same thermal water that fills the Pamukkale hot springs pools also feeds a number of the luxury hotels on the plain above Hierapolis. By staying at one of the hotels, you can have a similar relaxing experience without all the people (and without the cool columns in the Antique Pool). Unfortunately, the waters that are diverted to the hotels have caused some problems for the travertine terraces you see in Pamukkale (a lot of the terraces have empty pools). The government is working on a solution to counter the problem. 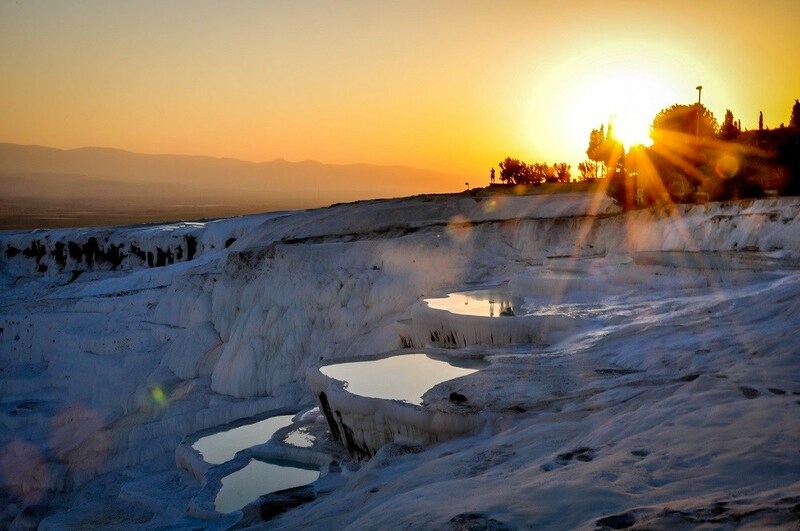 Pamukkale is located about 18 kilometers north of Denizli, Turkey. 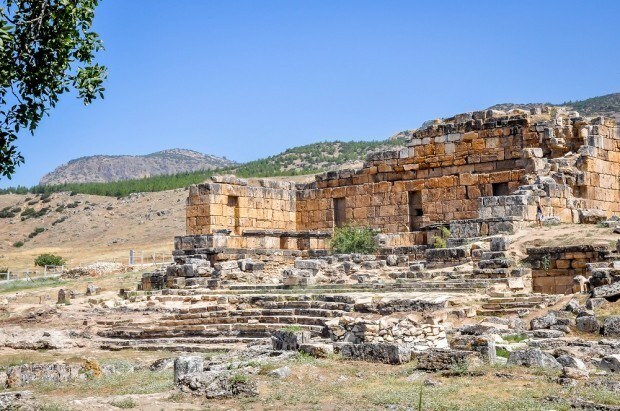 It is located half-way between Izmir and Konya in Southeast Turkey, and about a half days drive from Izmir, Ephesus, Bodrum and other commonly visited places in Turkey. The most iconic feature of Pamukkale, Turkey are the white travertine terraces or travertine pools that cacade down the hillside above the town. This iconic feature is sometimes called the Cotton Castle of Turkey, but it lefts us with the nagging question: how does travertine form? Evidently, it’s a simple matter of chemistry. The water trickles and flows down the walls leaving behind the famous “cotton fortress” of minerals. This is the famous Cotton Castle These travertine terraces have been forming and growing for millennia. In the late afternoon, we hiked up the travertine formations. Signs direct visitors to remove their shoes to protect the formations. The water ran cool, but not cold, on our feet. As we hiked up the formation, we noticed that some people brought swimsuits and lounged in the travertine pools, which weren’t deep. Others smeared mud on their faces. But we just hiked up and took pictures. As we walked down, bats took to the skies by the thousands. During our time visiting Pamukkale, we stayed at the Richmond Pamukkale. This large, nondescript hotel sits on the high plain behind the Pamukkale-Hierapolis complex. According to review sites on the Internet, this is the best hotel in Pamukkale. And that may be the case, but it left us wanting a lot more. The beds were rock hard and the whole building had a college dorm-like ambiance. The breakfast was served in a large cafeteria and had an institutional feel. However, the one great thing about the Richmond Pamukkale is the spa and pool complex. The indoor pool is like a nicer spa, but they ask you to wear shower caps. I get the requirement of bathing before the pool, but shower cap was weird. We were able to soak in the warm water completely alone for about 20 minutes before it got too warm. The indoor pool closed at 10:30pm, so we moved it outside to the two mineral pools, which were very nice. 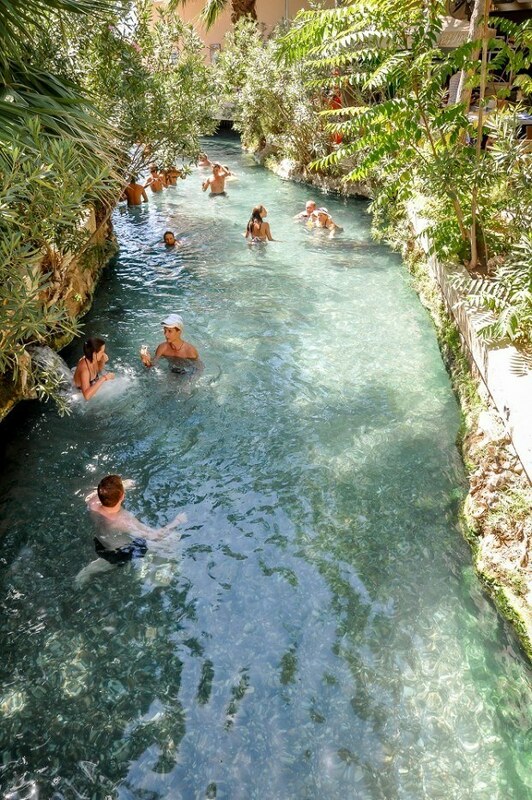 Compared to the large number of visitors at Cleopatra’s Pool, the private Pamukkale hot springs at the Richmond made for a much more intimate (and relaxing) experience. If you enjoyed this article, you may want to sign up for our monthly newsletter, THE FIX. We share exclusive content, amazing travel deals, give you sneak peeks of our future trips, and other special surprises. 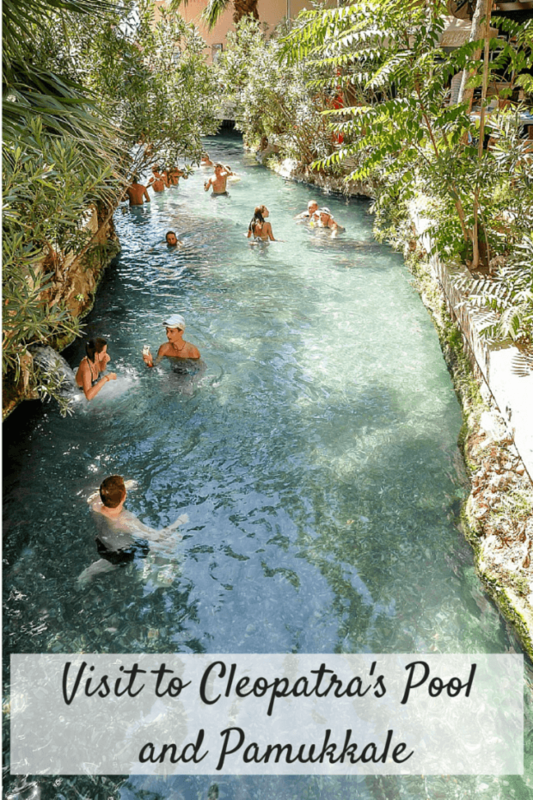 Do you like visiting hot springs when you travel? Have you been to these Turkish springs? 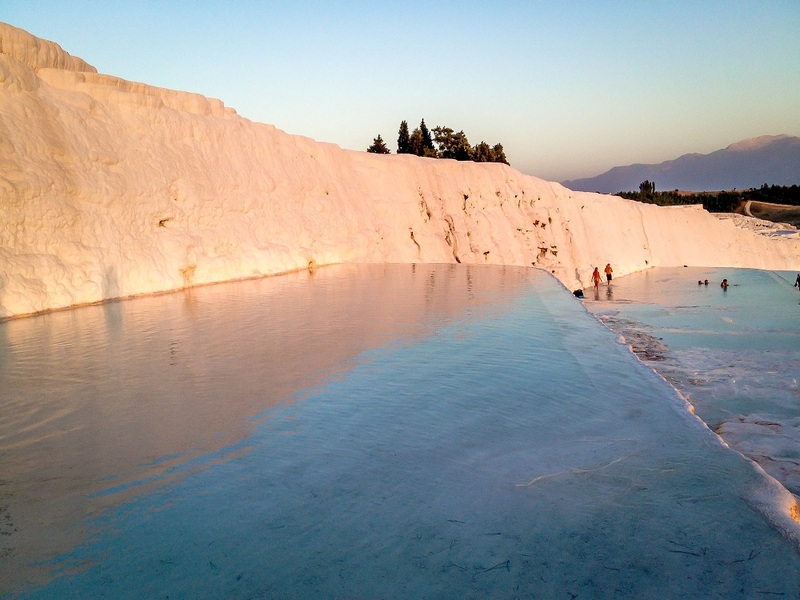 What do you think about Soaking in Cleopatra’s Antique Pool at the Pamukkale Hot Springs? I wish I would have hit these pools when I went through Turkey. Really need to next time. Looks like so much fun. We’re huge fans of hot springs pools (I grew up in Colorado). So we always try to stop at them on our travels. 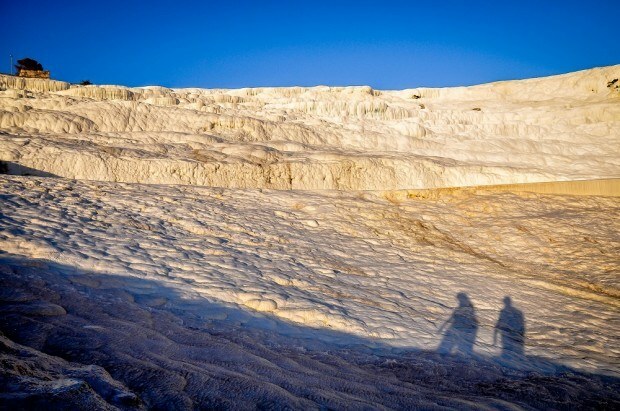 Pamukkale is definitely one of the highlights. It is wonderful, the water is great, but it gets lots of tourists. Ruins and pools, what a great combination! I will put this one on my list. I’ve been here, I love visiting thermal springs! This is one of the places we’d love to go if we ever make it back to Turkey. 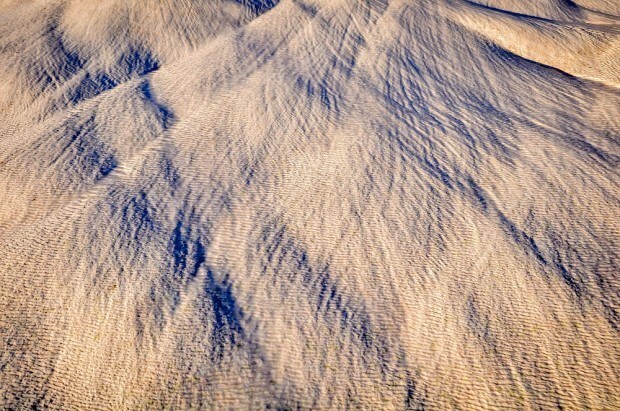 Here and Cappadocia! Wow, that’s an huge amount of people in the water, but when it looks so nice and inviting it’s pretty hard to say no to! Dale – there were a fair number of other folks, but it didn’t feel “packed”. Lots of room to move around, etc. At least, when we first got there. When we were leaving, the tour buses and day trippers were arriving, which would change the dynamic some. Thanks for the info, Lance! 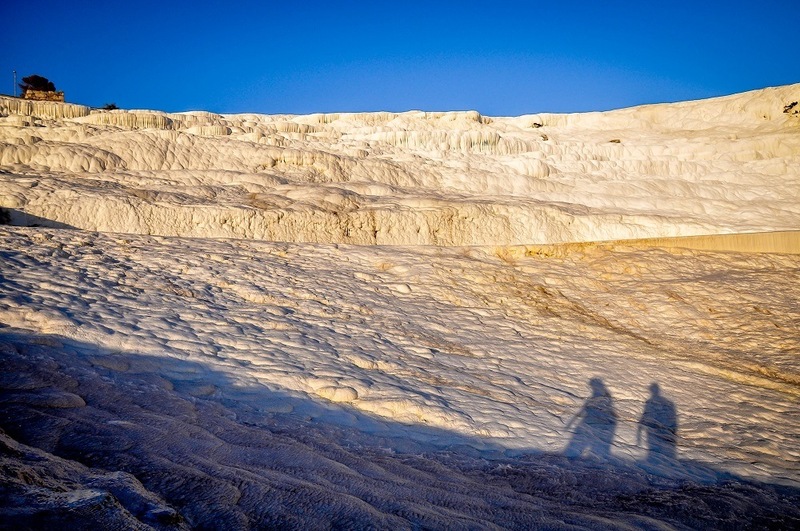 I read in another blog post (dated Nov 2013) that most of the travertines at Pamukkale are dried up. I take it that wasn’t the case when you were there? And this antique pool… this is an area separate from the travertines, correct? The travertines are just below the antique pool. The water comes out of the antique pool (and a few other places) and cascades down the travertines. Some of the travertine pools are dry, but many aren’t — the flow of the springs is partly dependent on the time of the year (highly flows in spring). UNESCO has been working with the Turkish government on preserving the travertines. Hope that helps. We haven’t tried too many hot springs, save for a pretty disappointing one in La Fortuna, Costa Rica. But we’ll be heading to Budapest (also know for hotsprings) in the next few weeks then on to Turkey – where we hope to experience exactly what you did above. Love that there’s so much history involved in these pools. Would be an awesome daytrip! I really want to visit Turkey this year and go to Pamukkale! Antalya is a large region so we can’t offer specific advice. We can tell you we rented a car and drove. Good luck!